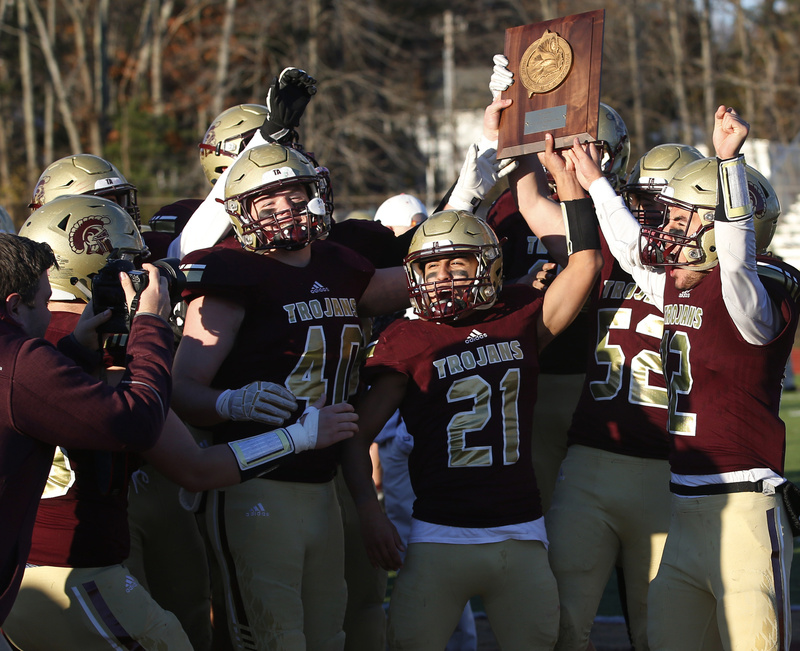 Thornton Academy players celebrate after they beat Scarborough 52-21 in the Class A South final on Saturday in Saco. 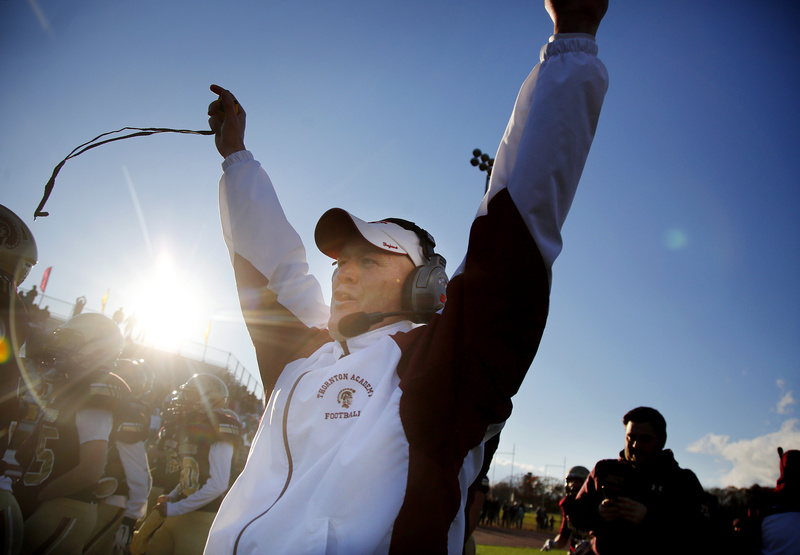 It was a familiar sight: Thornton Academy celebrating after a touchdown by Anthony Bracamonte. 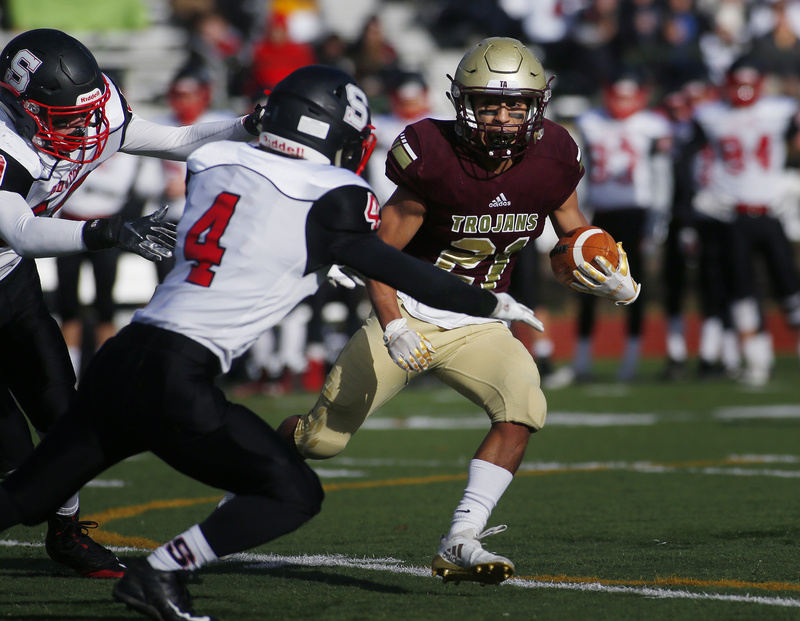 In the Trojans' 53-21 win over Scarborough in the Class A South final on Saturday in Saco, Bracamonte rushed for 300 yards and scored four touchdowns. Thornton Academy head coach Kevin Kezal throws his hands up to celebrate a touchdown run by Anthony Bracamonte in the second half of the Trojans' 53-21 win over Scarborough in the Class A South final on Saturday in Saco. 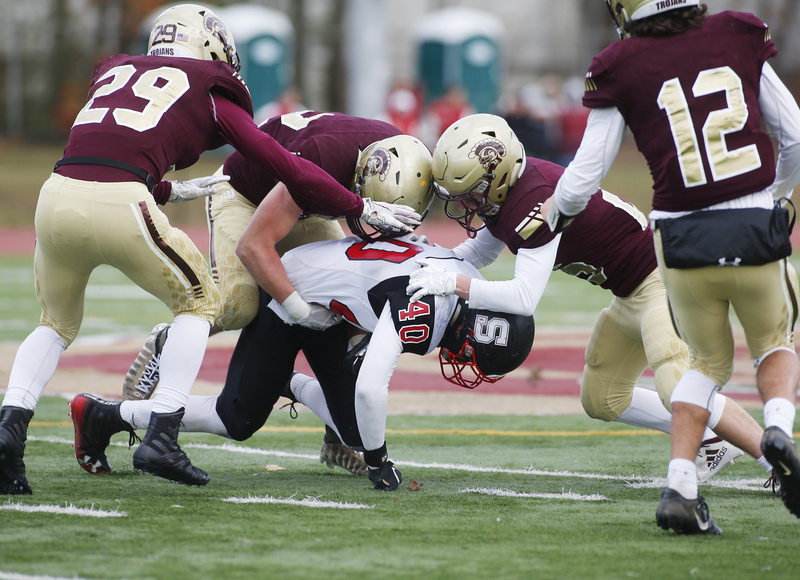 Scarborough quarterback Chase Cleary is sacked by Thornton Academy's Thomas Palmer in the second half of the Class A South final on Saturday in Saco. 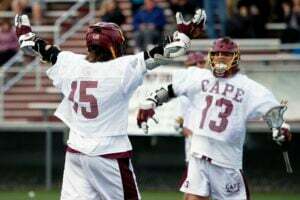 Thornton Academy won 53-21. 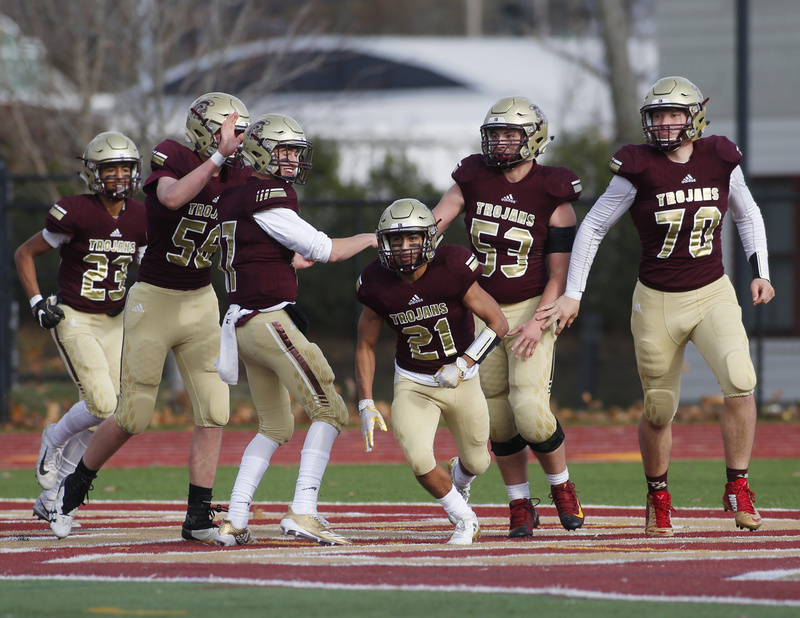 Thornton Academy defenders converge on Robert Cleary of Scarborough after he made a catch in the second half of the Class A South regional final on Saturday in Saco.  The Trojans won 53-21. 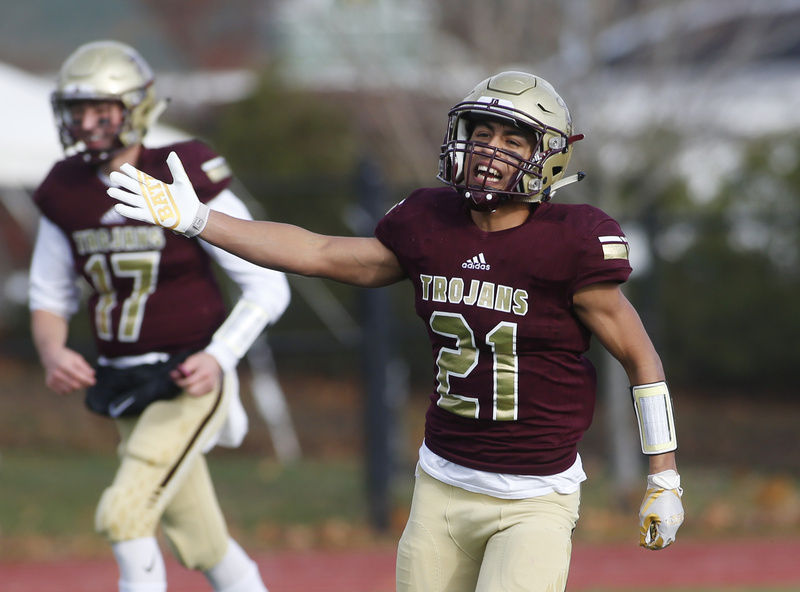 Thornton Academy's Anthony Bracamonte celebrates one of his four touchdowns during the Class A South final against Scarborough on Saturday in Saco. 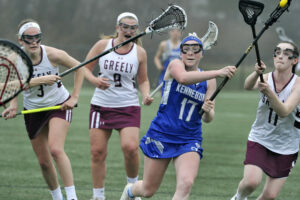 The Trojans won 53-21. 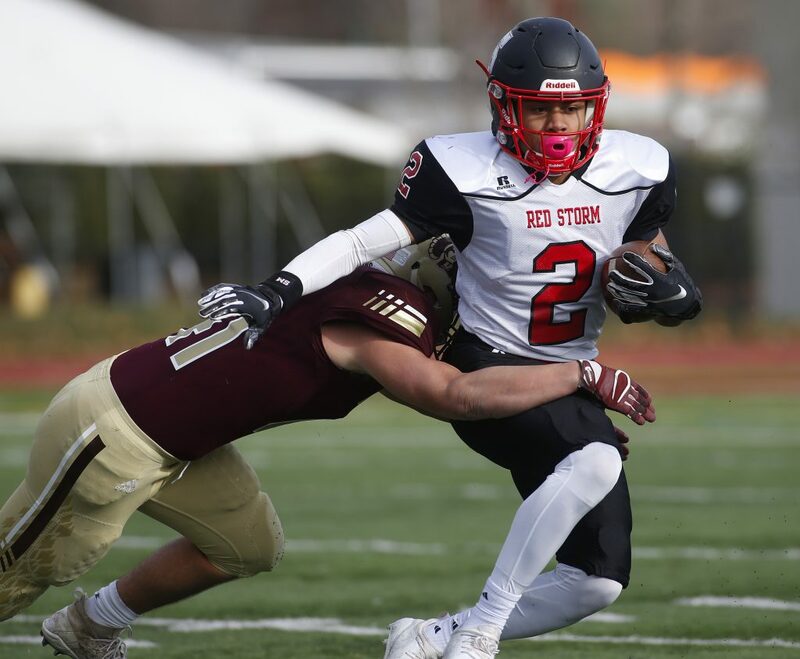 Thornton Academy's Anthony Bracamonte a tackle by Scarborough Evan Foley of Scarborough in the second half of the Class A South regional final on Saturday in Saco. 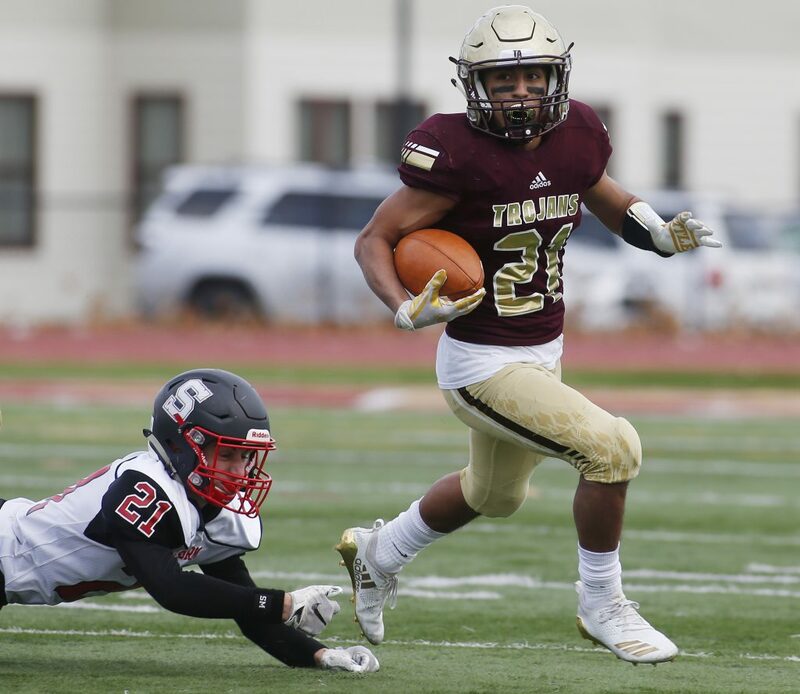 Bracamonte rushed for 300 yards and scored four touchdowns as the Trojans won 53-21. 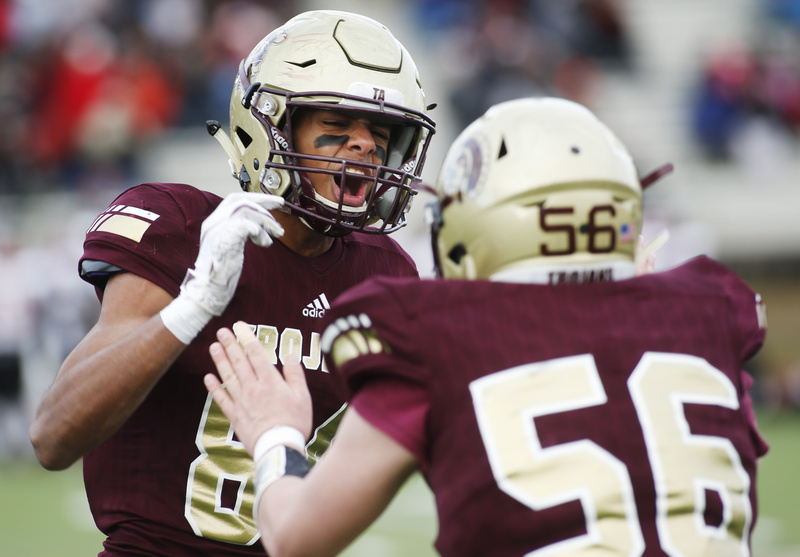 Thornton Academy's Raine Bagudu, left, celebrates with teammate Tom Wermenchuk after the Trojans recovered a fumble in the second half of the Class A South Regional final on Saturday in Saco. 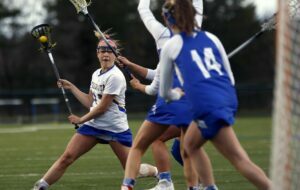 Thornton beat Scarborough 53-21. 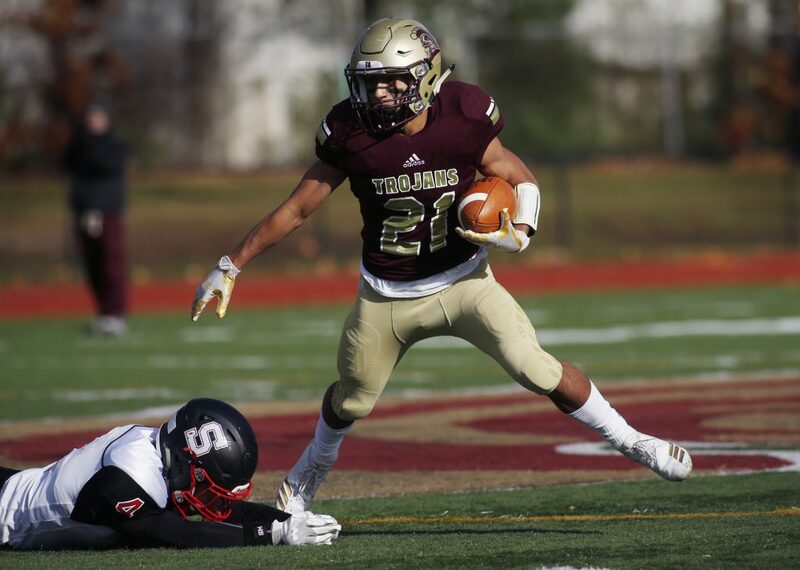 Thornton Academy's Anthony Bracamonte finds room to run in the second half of the Class A South football final against Scarborough on Saturday in Saco. Bracamonte rushed for 300 yards and scored four touchdowns in the Trojans' 53-21 win. 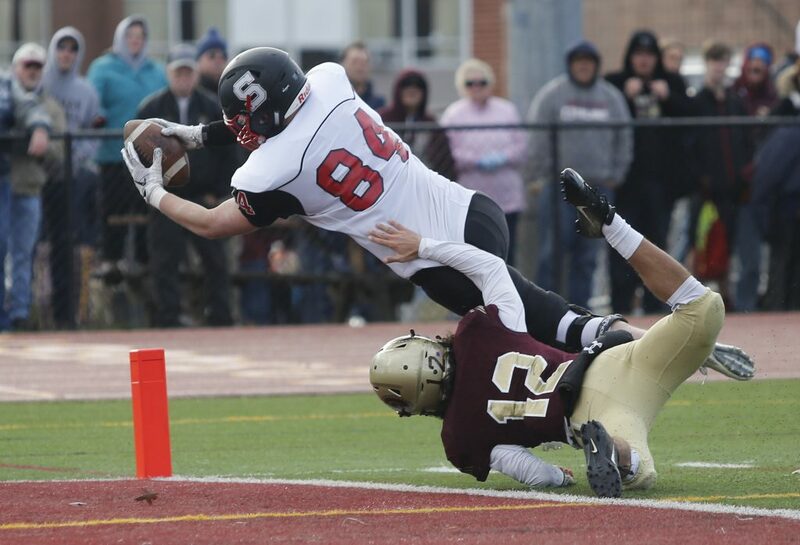 Thornton Academy's Anthony Bracamonte of escapes a tackle by Scarborough's Zachary Alofs in the first half of the Class A South final on Saturday in Saco. 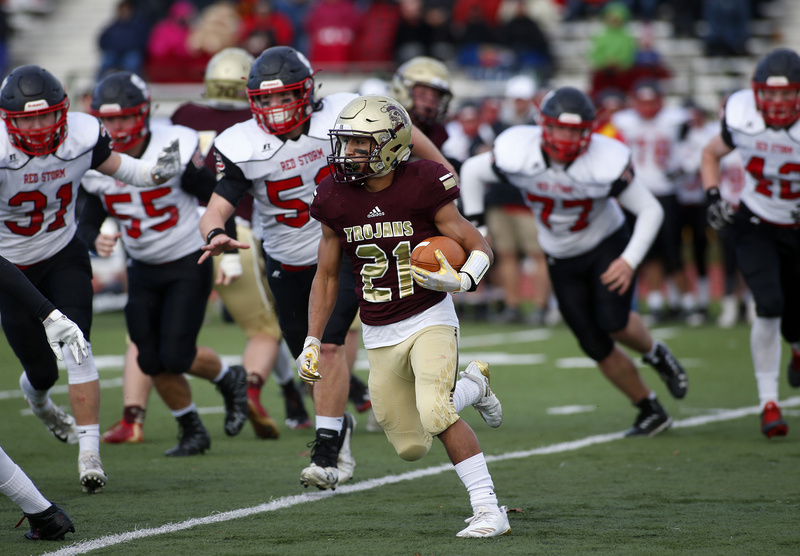 Bracamonte rushed for 300 yards and scored four touchdowns in the Trojans' 53-21 win. 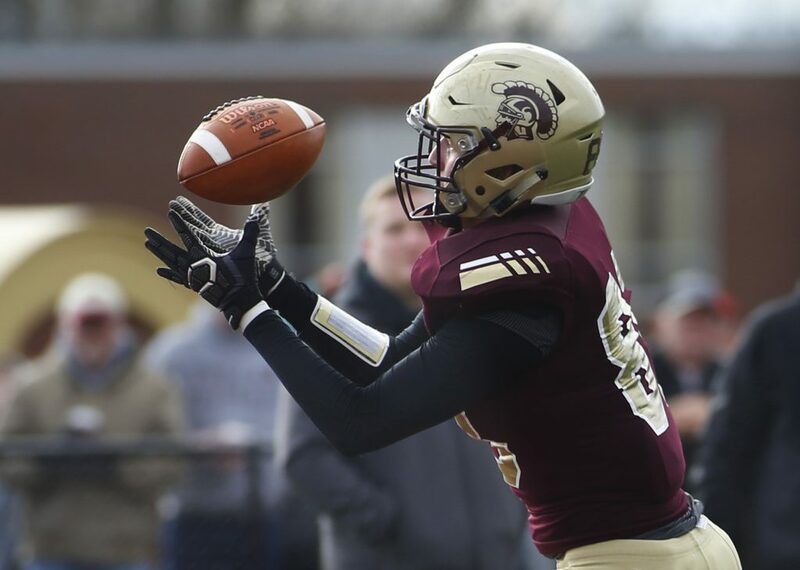 Thornton Academy's Athan Gikas tries to keep Scarborough's Jared Quintiliani out of the end zone during the Class A South final on Saturday in Saco. 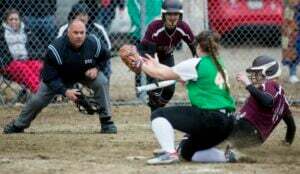 Thornton Academy won 53-21. 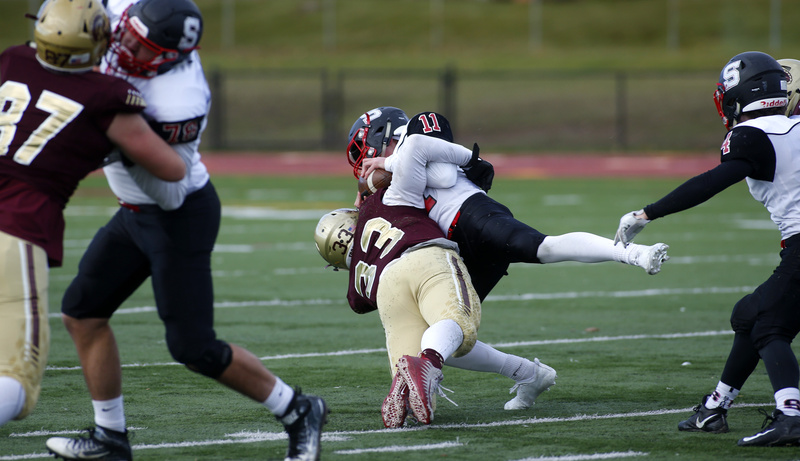 Scarborough's Jarett Flaker is tackled by Thornton Academy's Cole Paulin during the Class A South final on Saturday in Saco. 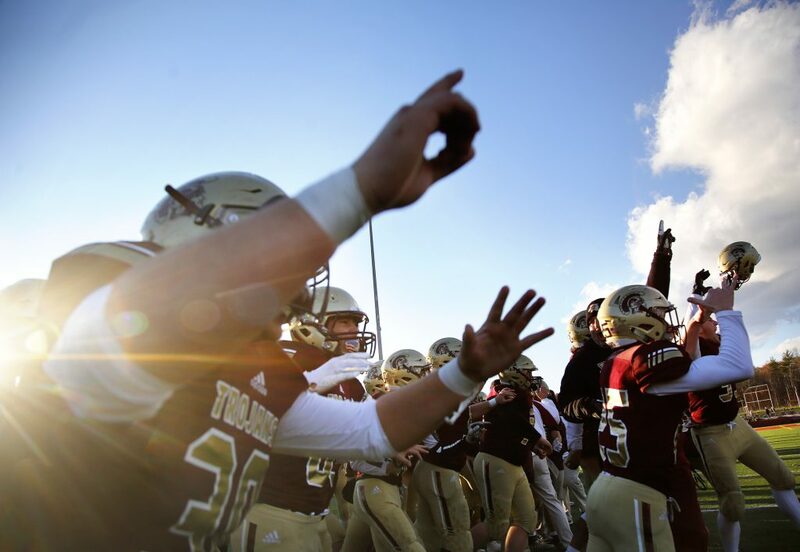 The Trojans won 53-21. Thornton Academy's Ethan Logan catches a pass in the end zone during the Trojans' 53-21 win over Scarborough in the Class A South final on Saturday in Saco.